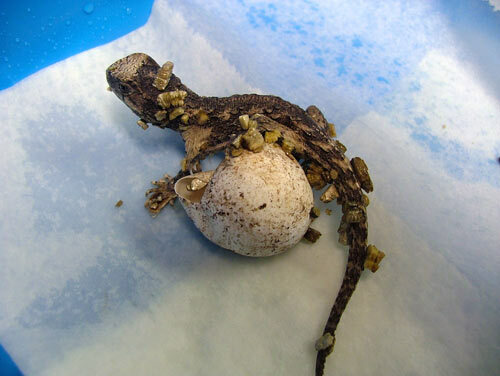 This tuatara hatchling is part of a captive rearing program at Victoria University of Wellington. Hatchlings have an egg tooth on the tip of their snout to help them cut their way out of the egg. In the wild, they emerge about a year after the eggs are buried, and must immediately fend for themselves. They weigh about 5–6 grams, and need to watch out for larger tuatara, who may eat them if given a chance.